Ninfa, one of the pioneers in Tex-Mex cooking, used to serve this green sauce in her restaurants. Since she's passed, the Ninfa's near me has stopped adding avocados, no doubt due to the expense, which is not worth eating. So, I make my own. The hardest ingredient to find may be green tomatoes. 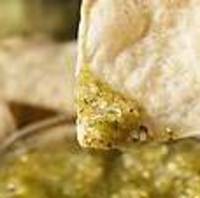 Plan on making this salsa for 6 or more guests, as it doesn't keep very well until the next day. This recipe has been printed in numerous publications over the years, including "The Houston Chronicle." In a saucepan, cook the first 4 ingredients over a medium low heat until liquid has evaporated. Wow Myra! I have been looking for this since my visit to El Paso. There's is so hot it can launch the Space Shuttle. I think they are dripping in some green habanero sauce called Yucateo...but now I know how to make the base for it. What they are doing to cut corners on the cost of the salsa would not surprise me, as it's not a cheap table sauce. Years ago, I used to go to her restaurant and eat so much of this salsa with fresh flour tortillas that I had to take the rest of my order home in a to-go box. What they are doing to cut corners on the cost of the salsa would not surprise me, as it's not a cheap table sauce. Years ago, I used to go to her restaurant and eat so much of this salsa with fresh flour tortillas that I had to take the rest of my order home in a to-go box. Another saude recipe to add to my to do when needed sauces. It gets boring to use the same sauces when it comes to kids. Making new ones help. I have to tackle the tomato truck that docks at El Rancho to get green tomatoes. Very hard to find in Dallas, for some reason. Didn't know they would freeze well. Blanched first?